Espiritu Santo Island is the main Island of Sanma Province in the Vanuatu (Republic of Vanuatu, New Hebrides). Espiritu Santo is Spanish for "Holy Spirit" also known as "Santo" or "Santos" the largest island in the nation. Borders to the north St. Philippe and St. James Bay, to the east Turtle Bay and to the southeast Segond Channel, Aore Island, Tutuba Island, Bokissa Island and Malo Island (Mallo). Offshore are many small islands off the southeastern including Matte Vulu Island, Mavia Island (Mafia), Aesi Island and Palikulo Island. During the Pacific War, Espiritu Santo was code named "Ampersand" and in February 1943 renamed "Buttons" and finally "Ebon". 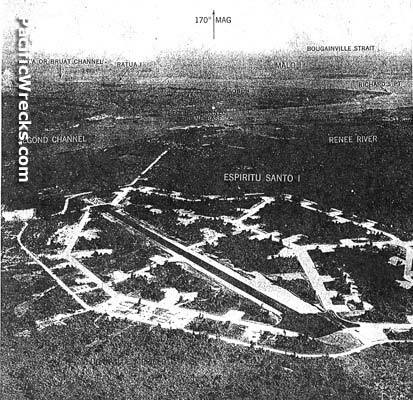 On May 28, 1942 the first American forces arrived on Espiritu Santo and began developing the island into a staging base and support area with naval facilities, airfields and a seaplane bases. Located at the southeastern corner of Espiritu Santo. Major American logistical base, port and dry dock area during the Pacific War. Today the second largest town in Vanuatu. American camp area on a hill in the middle of a coconut grove. Named in honor of Captain Henry T. Elrod, the first U. S. Marine who earned the Medal of Honor defending Wake Island.